Binding Adjustability: The only bits to adjust are the straps and they’re tool less bolts. Easy to undo and bolt back on. Straps: This was actually the best shaped toe strap for my boot size and shape out of the whole Now line. It fit well over the toe and stayed put with no migration at all. I would like to see some sort of retainment on the strap for the adjuster. Being held on by a single point meant the strap could spin around on the adjuster bolt. A gate or nob or something would be super useful. The Sieva ankle strap has a similar feel to its stiffer sibling on the Drive and Select with a softer and more flexible feel. 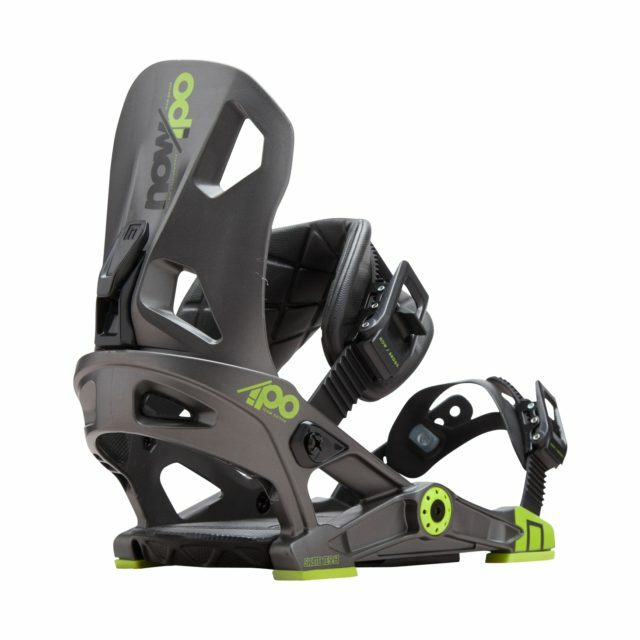 It’s still not a noodle strap and has enough substance for anything short of full on freeriding, but it won’t compensate for a noodle flex boot like the stiffer ones might. It was comfortable all day with no pressure. Ratchets: Smooth cranking and releasing, nothing to speak of. Highbacks: Unrestricted middle of the road flex. More torsional flex than straight back, with the mini-wing to help keep everything behind you where you need it. It’s a little bit of a shorter back to help keep everything feeling a little bit looser. Binding Flex: Just under middle of the road. The slightly softer strap really is what keeps this being a little bit of a softer binding. Ride: Hangar 1.0 is a little tight in the heelcup and you can really notice it on this binding. The softer flex wants to let you move around but the narrower heelcup doesn’t. Skate tech does a great job driving the board at your feet and the bushings are great for soaking up rail pings and make for great landing gear. Rider in Mind: Lighter all mountain guy or park rider hitting everything in his way. Personal Thoughts: For me the narrow feel of Hangar 1.0 just got in the way. If you have a narrow ankle/heel and are in a boot with a narrower ankle profile you probably won’t be bothered by it, but if you are in something wider and don’t need a lot of lateral support I would look at the Brigade.